I absolutely LOVE learning about beliefs and customs in different cultures. I am always eager to learn about the different religions around the earth, the different customs, and how different people live…. Sometimes I find that I admire certain aspects of their ways of thinking and even adopt it to become part of my ever-evolving personality, and sometimes I observe their customs with awe, knowing that even though I find them fascinating, I would never adopt any of them for my own life. Still, it is fascinating to see the different customs and to talk to people and to reflect about what I see. We are all humans, so what makes some of us believe that we can do things easily, while others believe that they can’t, and of course this goes beyond physical abilities into beliefs and ideas about abundance, happiness, good health, etc. Anyway….In the morning we saw a large temple complex. 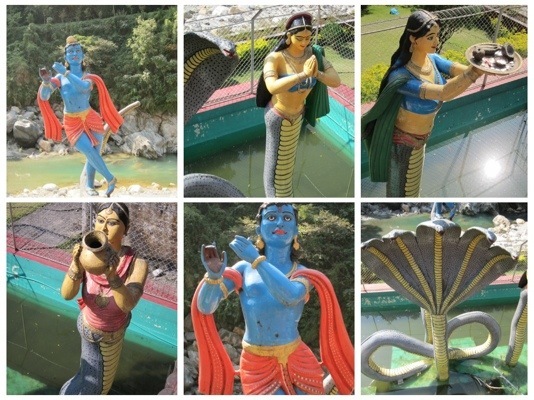 It looked like a colorful theme park for kids, with a huge statue of Hannuman, the monkey god, the sacred cow and what looked like a swimming pool from a distance, but turned out to be a shrine fountain for Shiva. 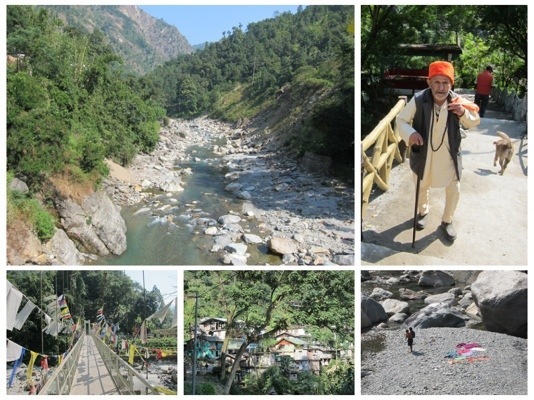 The complex was called Ramayan Prasad and it was in the town of Reshi Bazar in Western Sikkim. 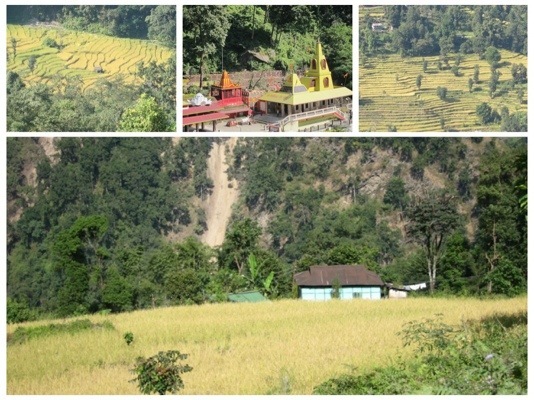 This temple complex offers pilgrims an opportunity to worship many gods in one location. There was even a small Buddhist shrine in between the different Hindu temples. 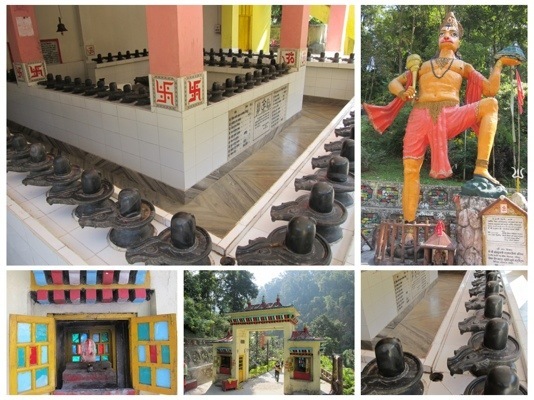 One of the more interesting temples was dedicated to Shiva Lingam. It featured hundreds of Shiva Lingam Phalluses and during worship times or festivals, devotees come to worship these Phalluses. 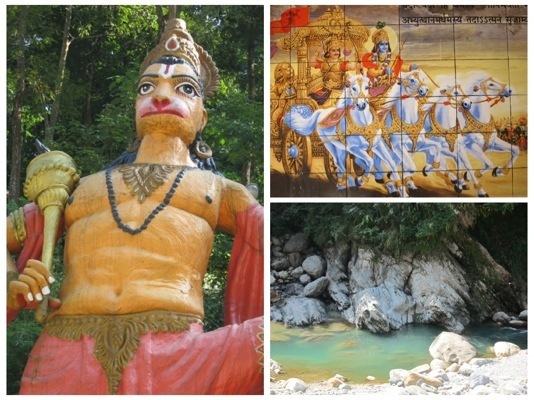 Nearby stood the fountain of the five-headed snake with Lord Shiva. The Shiva story says that a five-headed cobra rose above Shiva’s head as he sat in meditation in the forest. Instead of harming lord Shiva, the dangerous cobra crawled into the rock that he sat on, and this became the phallus stone which is worshipped today. Our guide Sudesh told us that during one of his guiding trips, while walking in the forest, he saw a real three-headed cobra. In one of the temples, we saw a man sitting in front of a priest on a ground that was covered with flowers, astrological symbols painted on the floor, and food offerings. There were also small oil lamps, flower garlands, bottles of oils, colorful spices, fruit, rice, cakes and more. The priest was doing a puja for the man who came seeking healing. The Graha is done to align the man’s energy with the planets, to help him regain his balance and good health. It is believed that those who are sick, are out of alignment, or are negatively influenced by the planets. 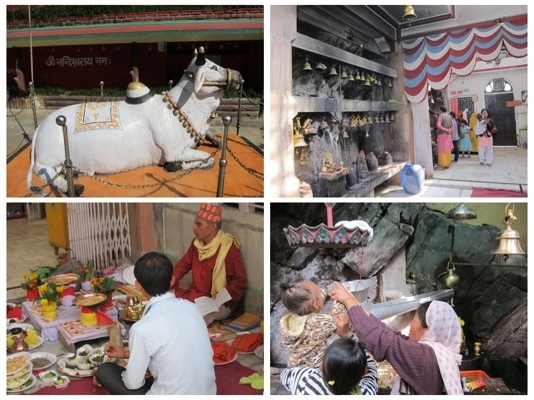 The ritual included sprinkling water with flowers floating in it, lighting candles, making an offering of slices of apples, oranges, banana leaf, and paste of colorful spices, then touching the offerings with the different spices, ringing bells, pouring water on the shiva lingam rock and more. At first glance, it all looked a bit weird…. How can water and flowers align somebody’s energies with the planets?….. But there is a deeper philosophy behind this Graha belief. Buddhism and Hinduism have deep beliefs in astrology. It is common among Buddhist people as well as Hindu people to consult an astrologer when looking for advice at crossroads in life. People consult an astrologer if they wish to get married, or start a new business venture, make a hard decision in life, etc. In ancient times, almost ALL religions looked to the stars, and astrology and religion were closely linked. In the early days of Hinduism, enlightened seers, called Rishis, believed that all physical reality was “influenced” by different forces that influenced all of life. You can get an insight into how the belief in astrological planets influenced every day life, by looking at the names of the days of the week in some European languages. Sunday was believed to be governed by the Sun, hence the name Sun-day. Monday was believed to be governed by the Moon, hence the name Moon-day or Lunes in Spanish, which means the day of Luna- the Moon. Tuesday was believed to be governed by Mars – Merdi in French or Mars-day or Martes in Spanish. Wednesday was believed to be governed by Mercury – Miércoles in Spanish, or Mercredi in French. Thursday was believed to be governed by Jupiter – Jueves in Spanish or Jeudi in French. Viernes in Spanish and Vendredi in French- the day of Venus. In Hindu astrology, they use the term the Nava Grahas. The Nava Grahas are therefore, the nine influences of the planets over our lives. Some think that Rahu and Ketu are the Hindu equivalent of Neptune or Pluto, but Hindu scholars say that they may not be additional planets, but the North and South Lunar Nodes, or mathematical points of calculation. Nodes are the points at which astrological planetary orbits meet. In Hindu mythology, Rahu and Ketu are described as two parts of a demon who swallows the sun and the moon. A solar or a lunar eclipse was believed to be the work of that demon who swallowed up the sun or the moon. There is a common Hindu belief that it is unlucky or even very dangerous, to look into an eclipse or even to be outside when an eclipse occurs. People lock their doors, Temples close, homes shade their windows, and people are instructed not to travel anywhere and not to eat anything. An eclipse is thought to be a particularly dangerous time for pregnant women. It is believed that the mixture of the sun’s and the moon’s rays, creates highly toxic rays of light that reach the earth. It is believed that these rays contaminate whatever they strike, and can cause miscarriages and deformities in pregnant women. After the eclipse, temples and homes are washed, and purifying Pujas are performed to cleanse the atmosphere. It is believed that one of the Grahas might be exerting a negative influence over the life of a person, and thus people ask the priests to perform a puja to get rid of the negative influence. It is also believed that if a particular Graha is exerting a positive influence, a person may perform a puja to increase this positive influence. There is also a puja called “Graha Shanti. Shanti means peace, and this kind of puja is performed before weddings and other important cornerstones in life, when one wishes to express gratitude and peace towards the Grahas. The Sun represents the soul, the heart, the father, authority, heat, power and ambition. The Moon represents the mind, mother, water, coolness, emotions, memory and common sense. Mars represents courage, bravery, sports, competition, masculinity, passion, action, war, cuts and burns. Mercury represents intelligence, learning, teaching, speech, expression, communication and writing. Jupiter represents fortune, expansion, wealth, children, religion, philosophy and wisdom. Venus represents marriage, love, romance, luxuries, prosperity, femininity, artistic expression, grace, and beauty. Saturn represents slowness, struggle, discipline, dryness, labor, asceticism, accidents, and chronic disease. Rahu represents material desire, dullness, ignorance, laziness, sleep, addictions and ancestral karma. Ketu represents asceticism, spirituality, psychic ability, ghosts, eccentricity and occultism.